Below stated Interest rates are Subject to fluctuation in line with regular NRFC Rates. They say sleep escapes the affluent. 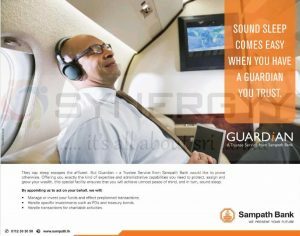 But Guardian – a Trustee Service from Sampath Bank would like to prove otherwise. Offering you exactly the kind of expertise and administrative capabilities you need to protect, assign and grow your wealth, this special facility ensures that you will achieve utmost peace of mind, and in turn, sound sleep. Manage or invest your funds and effect preplanned transactions. Handle specific investments such as FDs and treasury bonds. Handle transactions for charitable activities. Proposals are invited from Interested Investors to develop the following sites for Logistic operations according to the new Megapolis Plan of the Government. 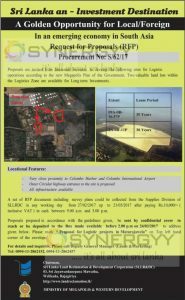 Two valuable land lots within the Logistics Zone are available for Long term Investments. A set of RFP documents including survey plans could be collected from the Supplies Division of SLLRDC in any working day from 27/02/2017 up to 21/03/2017 after paying Rs. 10.000/- ( inclusive VAT) in cash between 9.00 a.m and 3.00 p.m.
Proposals prepared in accordance with the guidelines given, be sent by confidential cover to reach or be deposited to the Box made available before 2.00 p.m on 24/03/2017 to address given below. Please mark “ Proposal for Logistic projects in Muturajawela” on Top left hand comer of the envelope. Open a Cargills Bank Salary Account, remit Rs. 25,000 or above and receive valuable gift vouchers. 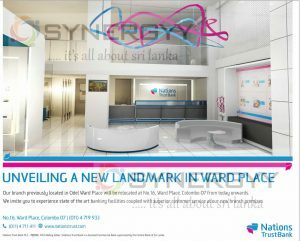 Nations Trust Bank branch previously located in Odel Ward Place will be relocated at No.16, Ward Place, Colombo 07 from today onwards. Vallibel Finance a BBB- rating finance company with stable outlook, announces a special interest rate for senior citizens as 16.60% interest rate Per Annum at 5th year maturity or 12.85% of Annual Effective rate. 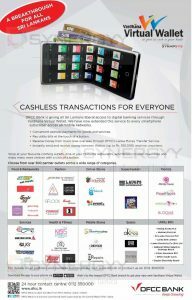 DFCC Bank is giving all Sri Lankans liberal access to digital banking services through Vardhana Virtual Wallet. We have now extended this service to every smartphone subscriber across all mobile networks. Convenient cashless payments for goods and services. 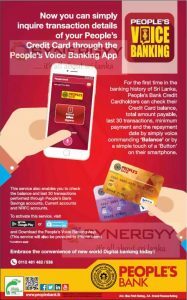 Pay utility bills at the touch of a button. Receive money from loved ones overseas through DFCC’s Lanka Money Transfer Service. Instantly send and receive money between Wallets (up to Rs. 100,000) anytime, anywhere. Shop at your favourite clothing outlets, dine at your favourite restaurants, send flowers to your loved ones and enjoy many more choices with a click of a button. Choose from over 500 partner outlets across a wide range of categories. Seylan Bank brought you a new alternative option for your short term savings with weekly reviewed interest rate for Seylan Bank Money Market Saving Account. UB Finance a member of Union Bank announces a special interest rate of 16.08% of annual effective interest rate for15 months fixed deposits for senior citizens. Nations Trust Bank introducing a new saving account of Nations MaxBonus to maximise the saving with 60% bonus interest an addition to you regular interest income. Free Internet banking and mobile banking facility. Free service of instant SMS notification on all banking Iransactions. UB Finance BB rated Finance Company a Subsidiary of Union Bank announces a special interest rates for Fixed Deposits for upto 15 Months for Senior Citizens. Sampath Bank announces a special interest rate Saving Account of Samoath Sanhinda Saver as 7% per Annum and the interest rate will be added twice a month. Let the best times of your life begin with Sampath Sanhinda Saver Senior Citizens’ Account. 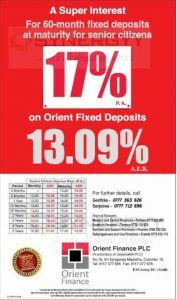 Seylan Bank announces a special interest rate of 12.5% per annum for 3 month fixed deposits more than LKR. 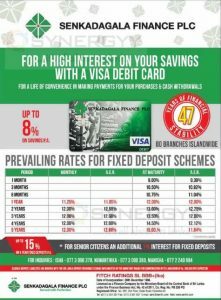 5 Million And you will get a special rate of 12% per annum if the deposits are lower than LKR. 5 Million for the same period. Sanasa Development Bank offers a highest fixed deposit interest rate among the state regional bank, Sanasa Development Bank is a BB+ Fitch rating bank for their financing position. Interest rate of 15% per annum available for senior citizen age above 60 years old for aggregate amount of one million rupees and special rate for citizens above 55 years also. for over 65 years Arpico Finance have guided you with accountability. Arpico Finance are determined to retain that untarnished reputation for years to come. Our promise is to guide you at every stage, leading you to the best financial solutions. Vallible Finance BBB- Fitch rated Finance Company in Sri Lanka announces a Highest interest rate for the fixed deposits made by senior citizen. this special interest rate are valid for 1 months to 5 year terms deposits. Enjoy the highest interest rate in the market, Seylan Bank PLC announces a special fixed deposits interest rate of 12.5% (13.10% A.E.R) for 3 month fixed deposit for the deposits more than Rs. 5 Million. If your deposits below Rs. 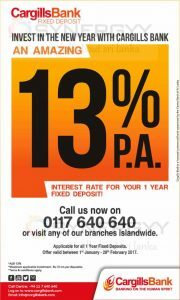 5 Million you can still get a best rate of 12% (A.E.R 12.55%) for 3 month fixed deposits. Senkadagala Finance a central Bank approved finance company in Sri Lanka with Fitch rating of BBB+; under taking Fixed Deposits from the depositors for their financing of loans and lease activities. As norms finance company interest rates are higher than the state bank; because finance company risk taking appetite is higher than state banks, so their interest rate for the fixed deposits are higher than banks. Cargills Bank announces a highest interest rate of 13% (Annual Effective Rate) per annum for 1 fixed deposit with maximum investment of Rs. 10 Million. This rate is best interest rate available in market compare to other financial service providers. This special offer valid from 1st January to 28th February 2017 only for more details contact to Cargills Bank on 0117 640 640 or visit any of our branches islandwide. 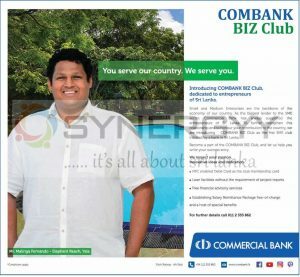 Central Bank of Sri Lanka brought a convenience way to transfer money by using CEFTS (Common Electronic Fund Transfer Switch) instantly at any time of the day by Internet, Mobile, Phone, ATMs or Visiting the Bank (Over the Counter). 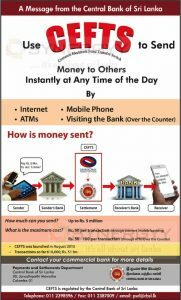 This service is active for send money up to Rs. 5 million at a cost of Rs. 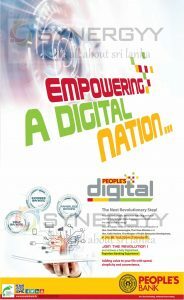 50 per transaction (through internet /mobile banking) or Rs. 50-100 per transaction (through ATM/Over the Counter). Common Electronic Fund Transfer Switch was launched in August 2015 and it transfer 610,000 transaction and Rs. 51 billion upto now. Softlogic Finance is a central bank approved finance company announces their interest rates for the fixed deposits as below, the highlight of this interest rates are 13.50% for 1 year fixed deposit and 14.50% interest rate for 2 years. Melsta Regal Finance Ltd announces their highest interest rates for fixed deposits as below, make a fixed deposit today and be witness for a higher returns and growth of your capital. 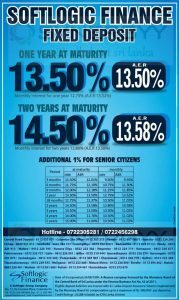 An attractive Interest rates for senior citizens, for more detail contact to Melsta Regal Finance Ltd on 0115 200 100 or see below image. The attractive reward scheme from Nations Kidz Children’s Savings Accounts will teach your child how rewarding it can be to save. Nations Trust Bank will partner with you in this fun rewarding experience and encourage your child to continue the good habit of saving. Orient Finance PLC announces a special 17% interest rate for 60 months (5 Years) Fixed Deposits) at Annual Effective rate of 13.09% for a senior citizens at maturity. These highest interest rates are only available from finance company due to their risk taking profile of their loans and leasing. For more details of 3 Months, 6 Months, 1 Year, 15 Months, 18 Months, 2 Years, 3 Years, 4 Year and 5 Year. For more details see below image or contact to Geethika – 0777 363 926 / Sanjeewa – 0777 712 696 or contact the Regional Managers as below province. Hatton National Bank (HNB) announced an attractive 12% interest rate for 3 month fixed deposits for valid for a limited time.